"Humor, horror, and beauty are the mini categories I have created. I have at least 100 photos of the game and my playthrough is cluttered with pauses for screenshots, but I’m loving it. So, show us what you got! Post your best work either in the comments section below, in the Benign with B-TEN Facebook group, or email your screenshots to [email protected]"
The more you comment, the more I think you might be my dad. Get off N4G, dad. You don't even like video games that aren't Centipede! Just bought the game, and I'm really looking forward to playing it for the first time on my shiny PS4. 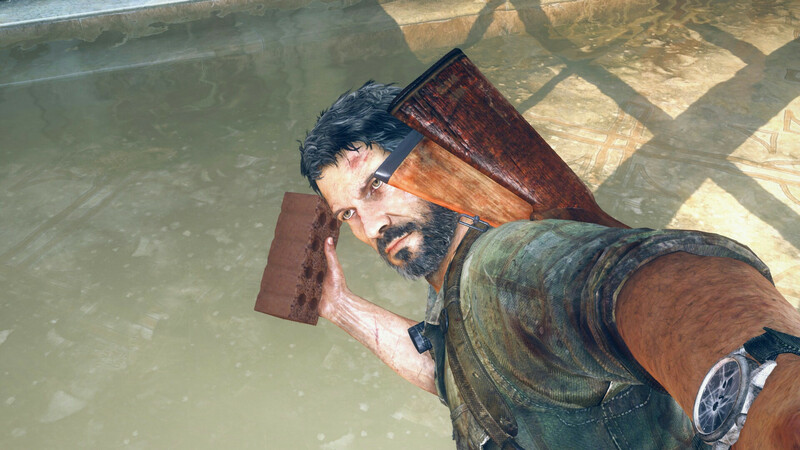 By the way, The Last of Us has the sexiest curtains in any game ever. No contest. What I also notice is the sound quality in the game. I played recently using the Sony Pulse Elite headset and the 7.1 channels surround sound is really awesome. EDIT: Also take a look at his arm, insane that a ingame model actually shows detals such as veins. And his watch, holes in it, and even the little stripes around it. I have some incredible photos already. The detail on Joel is amazing, right now to the pores of his skin, little splashes of blood, scars, veins, tendons, the weave in the fabric of his shirt. Beard Stubble. I have some screens 2 years ago you would have sworn were CGI. Imagine if Quantic Dream released the Sorcerer tech demo with a photo mode.